How Far is Sumadhura Acropolis? 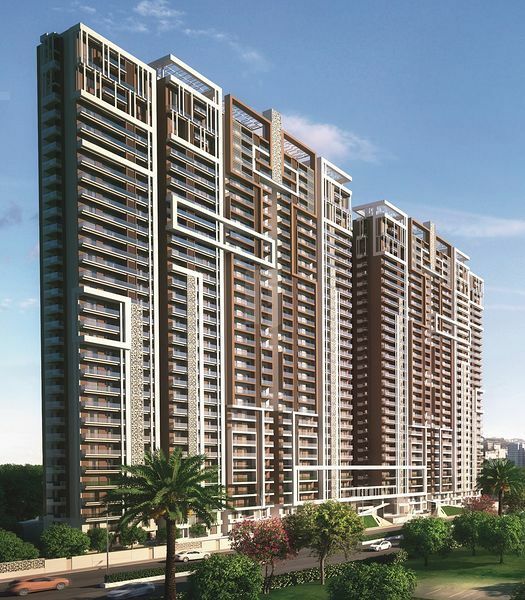 Sumadhura Acropolis a residential development by Sumadhura Properties.Sumadhura Acropolis is a high-rise project in the most desirable neighborhood of Hyderabad. It has a thoughtful design and is being developed with all the modern day amenities as well as basic facilities and will be built with the latest MIVAN technology. 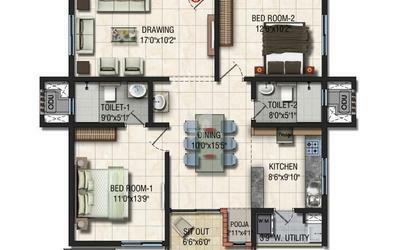 The project offers 2BHK and 3BHK apartments. Main doors : Engineered hard wood frame with designer shutters of 38 mm thickness with melamine finish on both sides. Internal doors : Engineered hard wood frames with designer shutters of 38 mm thickness with melamine finish on both sides. French doors : Upvc door systems with sliding shutters with provision for mosquito mesh. Windows : Upvc window system with clear float glass with suitable finishes as per design, with provision for mosquito mesh. All Hardware of reputed make. Common Area, Club house Lounge/ GF Lobby - Granite flooring. Living, Dining, Bedrooms &Kitchen : 800 X 800 mm size double charged vitrified tiles. Master Bed Room : Laminated Wooden Flooring. Bathrooms : Anti-skid ceramic tiles. All Balconies/Utilities : Rustic ceramic tile. Staircases/Corridors : Anti-skid Vitrified Tiles/ Natural Stones. Dadoing in Kitchen : Glazed ceramic tiles dado up to 2’-0” height above kitchen platform. Bathrooms : Glazed ceramic tile dado up to False-Ceiling height. Utilities : Tiles dado up to 3' Height. Granite platform with stainless steel sink at Extra cost. Provision for both drinking(Muncipal) and softened water. Concealed copper wiring of Havells or Equivalent. Modular switches : Northwest or equivalent make. Power outlets for air conditioners in all rooms. Power outlets for geysers in all bathrooms. Power plug for chimney, refrigerator, microwave oven, mixer / grinders, Water Purifier in kitchen, washing machine in utility area. Three phase power supply for each unit and individual meter boards. Miniature circuit breakers ( MCB ) for each distribution boards of best brands. FTH with FTH Wifi, internet, DTH, telephone & intercom. Fully treated water made available through an exclusive water softening and purification plant (in case of bore water). sewage treatment plant of adequate capacity as per norms will be provided inside the project, treated sewage water will be used for the landscaping / flushing purpose. For Apartments Metered DG backup up to 2 KV per unit except for A.C’s & geysers. 100% D.G. Backup for all common areas, Lifts, Pumps. Each 2 BHK apartment will have 1 car parking and 3BHK apartment will have 2 car parkings and parking will be in 3 levels. Reception, Lobby, Multi purpose Hall, Space for Association(Facility Manager Cabin , Management Committee Room), Fully Equipped Gym, Indoor Badminton Court, Squash court, Billiards, Table Tennis, Board Games , Yoga/ Meditation Hall, Library and Work From Home Stations, Guest Rooms, Spa Swimming pool with changing rooms. Fire hydrant and fire sprinkler system in all apartments and basements. Fire alarm and public address system in all floors and parking areas ( basements ). Control panel will be kept at main security. Supply of gas from centralized gas bank to all individual flats with pre paid gas meters. Round-the-clock security system. Intercom facility to all apartments connecting to security room. Panic button and intercom is provided in the lifts connected to the security room. Solar power fencing around the compound. Surveillance cameras at the main security and entrance of each block.